"We are not ready yet to teach these human beings the law of the Daleks!" 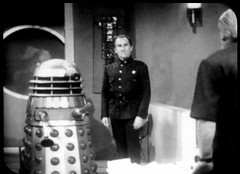 Lesterson flees the Dalek capsule deactivating the power supply and telling Janley what he's seen.Trying to talk to the examiner, he discovers the Doctor has been imprisoned. 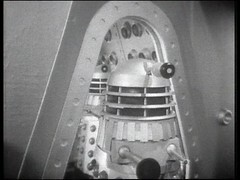 A Dalek comes out of the capsule and announces they can conserve power causing Lesterson to flee. 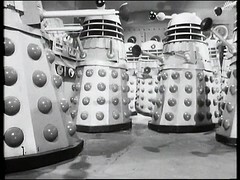 The Dalek instructs it's compatriots that no more than three of them may be seen together. The Daleks continue their cable laying. Valmar & Kebble are assisting them in connecting it to the capsule while guarding Polly. 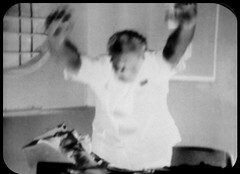 Lesterson tries to speak to the Doctor in prison but is taken to Bragen where Janley declares him to be mad causing Bragen to have him restrained. Polly tries to convince her captors of the Daleks evil. Hensell returns from the perimeter and discovers what Bragen has been doing in his absence. The Doctor & Quinn escape from the prison. Hensell argues with Bragen and then is gunned down by a Dalek on Bragen's orders. The Doctor & Quinn return to the Lab where they free Polly. Going to the Governor's office they find Hensell dead and are apprehended by Bragen again. 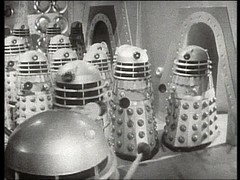 In the Capsule the Daleks gather preparing to wipe out the colonists. "Exterminate all humans! Exterminate, Annihilate, Destroy! Daleks Conquer And Destroy!" Episode 5 of a Dalek story and Hensell is only the second person to be exterminated! What's going wrong? They're going to make up for it in the next episode of course. And we get an explanation for the static electricity stuff that was annoying me last episode! The Daleks are charging themselves up in the ship but the static cables will allow them to travel further without having to return to the ship to recharge. That still doesn't quite fit with their behaviour in The Chase and Dalek Masterplan but it'll do for now. For a story for which no complete episode exists, lots of bits of Power of the Daleks exist. This episode contains one of two clips which have been in the BBC archives for years: from a 1968 edition of Whicker's world we have the "Daleks Conquer & Destroy" sequence, included on the Doctor Who - Lost In Time DVD. In it we see our old friend the broken neck ring Dalek, aka Dalek 2! There's another clip from episode 5 on the DVD but this is wrongly identified as episode 4! This features Dalek 1, the Dalek with the working lens aperture in it's eyestick, proclaiming that "We are not ready yet to teach these human beings the law of the Daleks!". Unfortunately at the end of this sequence it can be seen hitting the camera! 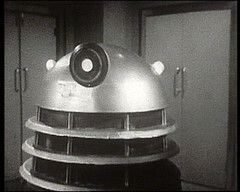 This clip came to light in 1995 when Restoration Team member Steve Roberts investigated rumours some Dalek footage was shown in an Australian program entitled C for Computer. It emerges that that title is the name of an episode of a show called Perspective and that it did indeed contain Dalek footage from episodes 4 and 5 of Power of the Daleks. Now can we have all 6 episodes found please?